Introducing White Orchid’s longarm quilting service using our Gammill Statler Stitcher computer-guided longarm quilting machine which is located in our Corfe Mullen Studio. From January 2014 we will be offering a wide range of quilting services to turn your tops into beautiful quilts. Allow us to complete your projects so that you get them on display or give them as a gift of love to your family and friends. For some of you the pleasure is in the fabric selection, choosing the design and then piecing it all together. The big chore, and sometimes the problem, is the finishing and final quilting mainly due to the weight and bulk of a full-sized quilt. Home sewing machines are not really designed to take large quilts but our Statler Stitcher is. At White Orchid we really want to give you the best experience possible and work with you throughout the whole process. We will give you regular updates on how things are going and will be available to you for any questions or concerns you may have. We love doing this and want you to love it too! In-depth consultations to guide you though the various options and select the services you want and need. This will help you to select the patterns, the wadding, the backing fabric and colours of thread to create the quilt of your dreams. Basting your layers to allow you to finish by hand or sew on your own machine. This will also allow you to take your layered quilt to your classes, workshops and club meetings without worrying that it will shift or separate when you are transporting it. Edge-to-Edge all over patterns, from simple to complex and everything in between. Select from our large range of patterns to suit most quilts and tastes. We can also obtain designs quickly from a selection of world-class designers if we have nothing you like in our portfolio of patterns. Customised block patterns, borders and corners. Binding the edges of your quilt by machine or by hand, or we can trim and return your quilt for you to complete the binding. Longarm Quilting Workshops and demos, get to use a longarm quilting machine and enjoy the freedom of drawing with thread. We can supply quality wadding (Hobbs Heirloom 100% Cotton, 80/20, 50/50 Cotton & Bamboo) and backing fabrics upon request or you can supply your own. We only insist that we supply the thread to ensure that it’s suitable for high speed, machine quilting; we only use high quality 100% cotton thread from the Signature and King Tut ranges for all our plain and variegated colours. 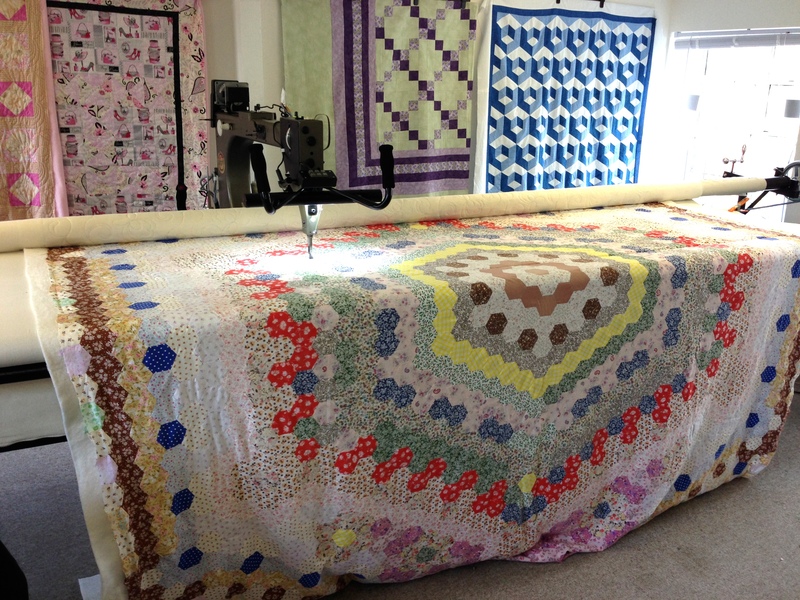 What is a Statler Stitcher Longarm Quilting Machine? The Statler Stitcher is the top of the range longarm quilting machine from Gammill. Our Statler Stitcher® utilises computer software and hardware to operate a longarm quilting machine capable of stitching almost any design. A Gammill® machine equipped with Statler Stitcher® can handle an intricately patterned king-size quilt in a matter of hours instead of days, and is guided by the computer instead of by hand. The system can determine the pattern size, block size, stitches per inch, repetitions of the pattern and the offset of the pattern. 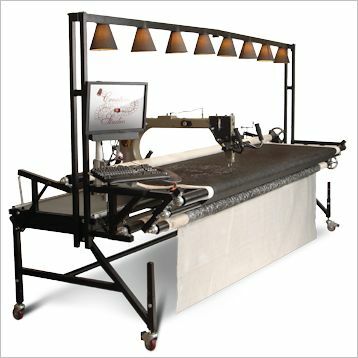 Our machine is the top-of-the-range model with a 14′ table frame and a 30″ longarm machine head. If it was a car it would be a Cadillac because being an American designed and manufactured product it couldn’t be a Rolls-Royce!